Aesop's fables are timeless stories for children that offer moral lessons in each tale. The classic stories are masterful collections that bring about a number of questions. Who was Aesop? Which are his most famous stories? How was his work preserved? Let's begin by exploring the person behind the fables. 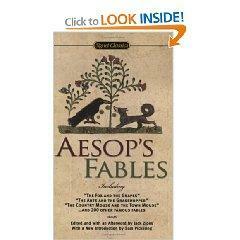 Aesop's fables stem from the mind of a man who is shrouded in mystery. While there is no autobiography available, Herodotus, known as the world's first historian, notes that Aesop lived in the Greece during the 6th century, BC. According to the account, he was born into slavery but was later given his freedom by his master. Many tall tales surround the ancient literary figure, including accounts of his death. Depictions of the man sometimes include a physical deformity, and he may have had a speech problem that suddenly disappeared. Some historians believe that Aesop never really existed. The many fables are well known for their simple moral lessons that have a timeless appeal. Children's literature often changes over time, but Aesop's fables continue to teach and inspire kids today. Perhaps one of the most appealing aspects of the stories is the embodiment of human characteristics in animal characters. This is readily recognized when considering the most popular tales developed by Aesop. Nearly everyone knows the tale of the Tortoise and the Hare. This simple story is a valuable lesson that applies to the literal experience of taking your time as well as the figurative notion of patience. The story is still shared on children's programs including Noggin. The Fox and the Grapes is a story in which the fox cries "sour grapes" after failing to reach his goal. The Wolf and the Crane tells a cautionary tale about helping the wicked. The Lion and the Mouse teaches us that small creatures can help the most intimidating beasts. The Fox and the Goat offers warnings against letting desire overcome common sense. The Dog and the Shadow tells a tale of a dog who loses his catch after trying to chase after an illusion. The Ox and the Frog is a sad story that warns that anger leads to self-destruction. The Fawn and His Mother suggests that intimidation can make someone forget his or her strengths. The Herdsman and the Lost Bull may inspire many to be careful what they wish for. The Bear and the Two Travelers is a hard lesson about friendship. The Horse and Groom sheds light on what it really takes to care for something. The Laborer and the Snake tells a tale of the inability to make peace. The Horse and His Rider teaches a lesson about consistency. There are many great benefits offered by the stories. They serve as a means to teach simple moral lessons in an entertaining manner. Each fable is quite short, making them easily digestible. Many of the stories relate to one another, so they can fit extremely well in lesson plans in the classroom or homeschooling activities. A pressing question involves how his work survived when the details of his life managed to wane away over the years. When Aesop's fables were initially created, stories were shared by oracles. People did not write stories. Instead, oracles told the stories and the stories continued to circulate. Four primary figures are credited with preserving the oracle tales. Babrius recorded many of Aesop's fables, putting them in poetically rhythmic meters. Phaedrus was a fabulist from Rome who recorded some of Aesop's stories in Latin. Planudes Maximus was a Byzantine scholar who put many of the fables into prose. La Fontaine was a French poet who wrote collections of fables based on Aesop's stories. As the stories circulated in written words, whether as poem or prose, the tales served as inspiration for art, literature and moral teachings. The inspiration continues today.